Amanda Michelle McCleve was born on May 10, 1980 in Mesa, Arizona. Amanda is the daughter of Victor and Julia McCleve long time residents of Gilbert. In addition to her parents, Amanda will always be loved by her sister Elizabeth Jobe and Justin Jobe, her brother William and Erin McCleve, and her sister Ashley McCleve, all from Gilbert. She was a favorite aunt to Madison Jobe, Steel Jobe, Navie Jobe, Madeline McCleve, Bric Jobe, Cole McCleve and Dane McCleve, all also from Gilbert. Amanda will always be remembered and loved by many aunts, uncles and cousins from Arizona, Mississippi, and Arkansas. Amanda was engaged to Nathan Hughes, son of Tim and Rachel Hughes, also from Gilbert. 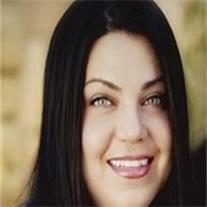 Amanda attended Gilbert Schools from kindergarten on and graduated from Highland High School in 1995. Amanda began her higher education at Chandler Gilbert Community College, transferred to UVSC in Provo, Utah, and eventually returned to Flagstaff, graduating from NAU with a Bachelor of Science Degree in Psychology, with a minor in Spanish. Amanda’s most enjoyable education opportunity was spending a year in Heredia, Costa Rica, attending a Spanish immersion program. After graduation, Amanda began working for the Flagstaff School District working with severely handicapped middle school children in the TIA program, a job that she loved and enjoyed. Amanda’s greatest joy was travelling and has travelled literally all over the world from Dubai and UAE, Europe, and all of Central America, but she was just as happy with a trip to Disneyland with her family. Her joy and love of life was contagious and is evidenced by the friends who have expressed how much she will be missed. The will be a Visitation Evening with the family at the Maplewood Ward building of the Church of Jesus Christ of Latter-day Saints, located on Greenfield Road just south of Pecos Road on Sunday, September 11th from 6:00 to 8:00pm and the Funeral Services will be held at the same chapel on Monday morning at 10:00 am. Interment will be held immediately following at the City of Mesa Cemetery. Arrangements by Bunker’s Garden Chapel.